Opening hours: Most shops and shopping centres are open from Monday to Saturday from around 9am or 10am until 2pm and then from around 4pm until 9pm, although some larger shops remain open throughout the day for example the big supermarket chains. Some stores are open on Sundays too. 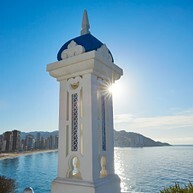 Fine golden sand, transparent waters and beaches that are clean and cared for throughout the year are a trademark of the Benidorm seafront. At its north end, two small coves of sand and rock are very suitable for diving and for those who like to swim alone, Tio Ximo cove and Almadrava Cove. Whether you are looking for an action packed, multi activity holiday or simply just want to try out something new to make your stay that little bit different and special, then look no further thanBenidorm, with so much to offer. Various events are held in Benidorm during the year, sun, beach, music all with one purpose in mind, to ensure you get more out of your stay. Do something different, don´t miss out. You still have not seen everything when it comes to theme parks and entertainment. The offer is so varied in just one single town, that you will not be able to decide on which one, but that's not a problem because you can visit them all! To spend a day enjoying all the fun that a water park has to offer, then Aqualandia or Aqua Natura Benidorm is your choice. Starting in the Torrejó Square you can walk up Carrer dels Gats, a typical street made of cobbles stones, to St James' Church built in the 18th century. From outside the church you can go under the archway that leads to Senyoria Square, Castelar Square and Mirador del Castillo. The views from here overlooking the Levante, Poniente and Mal Pas beaches, are among the most beautiful ones in Benidorm. 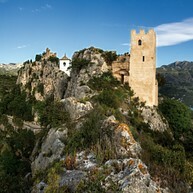 Continue your journey towards the harbour where you can go on excursions to the Island of Benidorm, Calpe and Tabarca. Other interesting places to visit in the town are Elche Park, Poniente and Levante Promenade and L'Aigüera Park. Funny bus, looking like an old-fashioned tram, which travels around the town and passes some of the most important tourist attractions in Benidorm. You can hop on and off at any of the bus stops as many times as you want during the day, allowing you to explore each area in your own time. They provide audio system in 8 different languages and the tour takes about one hour. A fun way to explore the city is this guided tour on a Segway that last for two hours. Before the tour starts, everyone will first do a training course with the qualified guide / instructor. 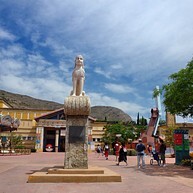 The tours are leaving from Parking Benidorm Palace, next to Circus Benidorm in the morning and in the afternoon. It works all year long. Be aware that booking is needed. 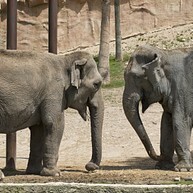 The traditional circus with animals has been replaced with new ideas. Benidorm Circus combines live music with fantasy, magic and comedy, a show that is put together with performances of jugglers, trapeze artists, magicians, contortionists, clowns...like in "Le Cirque du Soleil". Aqualandia is the largest water park in Europe and is ideal for all ages. 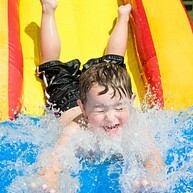 Experience the Niagara, slides, zig-zags, lagoon, black-hole, wave pools, adventureland for children, shows ... and much more! When the hunger kicks in there are several self-service restaurants, snack bar, barbecue, pizzeria, burgers and different kiosks to choose from. Aqua Natura has over 1000m of vertiginous slides, a wave pool, solarium, Spa and special swimming areas for children of different ages. There are five large sections here: the Zorba beach pool, the water slides, the kid’s pool, the lighthouse breakwater and the Spa-Sun Deck. Ideal for a day out for the whole family with fun and guaranteed excitement. Mundomar is a complete marine and exotic animal park. Flamingos, parrots, dolphins combined with spectacular performances, restaurants, picnic areas and a fabulous viewing point for unforgettable experiences! 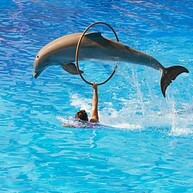 Don´t miss out the dolphin show that includes acrobatics and dizzying jumps. At the end of the show, you will get the chance to have your picture taken with a dolphin. In 320,000 m2 you can experience a unique environment with more than 1,500 animals of 200 different species (50 endangered) and 2,500 examples of flora in authentically recreated habitats in so called "Zooimmersion" that gives visitors the sense of being in the animals' habitats with no visible barriers, a new generation of wildlife park. The park are divided into four zones: Pangea, America, Asia and Europa. A park of fun and adrenalin-filled rides, where, as well as adventure and fun, visitors can learn about ancient Mediterranean civilizations: Egypt, Greece and Rome. Water rides, mechanical rides, the largest wooden roller-coaster in Europe and the "Phoenix", free fall of 60 m or the new attractions (Infinity and Inferno) ensure more than one visit to this huge park! Don´t miss out the shows that are offered around the park. Iberia Park has more than a dozen family attractions designed to enjoy with your family, especially for the younger kids. Transport yourself to a world of legend in The Rescue of Ulysses and get carried away by the stream of water in the Rapids of Argos. “The Boars”, “Battering rams”, etc., endless attractions for the "kings of the house" and many more surprises will complete the perfect day offering unlimited fun. Don´t miss out the shows that are offered around the park.